A new report on cloud resiliency calculates average system availability at "three nines," which could cost cloud providers in more ways than one. Amazon's cloud services downtime earlier this month annoyed some AWS customers but beyond that, it raised the question of how expensive cloud outage downtime can be. This week, a study group called the International Working Group on Cloud Computing Resiliency (IWGCR) released its first Availability Ranking of World Cloud Computing report. The working group was formed in March by two Paris-based higher educational institutions, Telecom ParisTech and Paris 13 University. The report's bottom line isn't pretty. 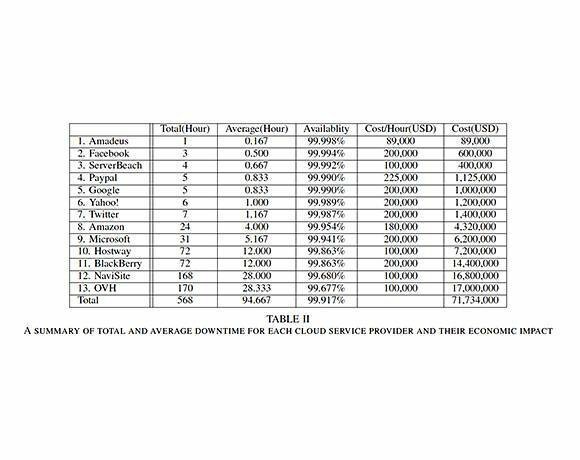 It estimates the average unavailability of cloud services at 10 hours per year or more, while the average availability is estimated to 99.9% or less. "It is extremely far from the expected reliability of mission-critical systems (99.999%) ... The cost of these failures amounts to more than $70 million [US] based on hourly costs accepted in the industry," the report states. The two-page report attempts to cover outages of some 13 providers annually since 2007. On the list are Amazon, PayPal, Facebook, Microsoft, Google, Yahoo, and Twitter, among others. Cloud services giant Amazon Web Services (AWS) came in eighth with 24 hours of outages -- but those outages occurred in 2009. Notably, the chart does not include any downtime from last year's highly publicized AWS outage, despite the report's claim that it only tracked outages that appeared in the news or press releases. The AWS outage earlier this month was too recent to have been counted in this report. Microsoft, which was ninth on the list, shows outages of 24 hours in 2009 and seven hours in 2011. That gave AWS an availability rating of 99.954% versus Microsoft with 99.941%. What's more, the report figures the outages cost AWS and Microsoft, $4.3 million and $6.2 million, respectively. In 2011, Research in Motion Limited had 72 hours of outages to its BlackBerry network of $14.4 million or availability of 99.86%. The biggest loser, according to the report, was hosting provider OVH. Based in Roubaix, France, OVH had 168 hours of outages in 2009, followed by another two hours earlier this year. That cost a whopping $17 million, plus earned it the unenviable 13th slot on the group's list. Several of these providers as well as others listed in the report were contacted, but did not provide comment. One disaster recovery expert who read the report challenged the working group's data sources -- press releases and news articles -- as superficial at best. To be fair, the IWGCR's report acknowledges its "imperfect methodology." The organization said in its report future work of [the] IWGCR will focus on improving the observation of cloud service availability and better measure the economic impact. Beyond problems with data sources and outage calculations, however, there are many other variables that need to be considered if such reports are going to be very useful, said Charles King, principal analyst at corporate advisory firm Pund-IT, Inc. in Hayward, Calif.
"What time of day an outage happens can determine the cost of the downtime," King said. For instance, if an outage occurs late on a weeknight -- as the latest AWS service outage did -- the potential loss may be significantly less if a customer is buying a book online rather than if it's a cash reconciliation application running at noon on a busy Friday. "If it's a book, I might just decide to buy it at a different time," King said. In fact, even with a more robust methodology, figuring out what an outage costs varies dramatically among customers. "When you buy a single VM [virtual machine] in the cloud, it's analogous to setting up a single server on your own infrastructure [whereas] if you need five nines [of availability], you don't just set up a simple machine," said Matthew Gerber, CEO of IT-Lifeline Inc., a disaster recovery provider built on AWS. IT-Lifeline was not impacted by the most recent AWS outage, he said.